Grilling a meal on a barbecue is one of the nicest ways to enjoy the great outdoors. You won’t have to daydream about your next cookout when you know how to build a brick grill. All you need to do after building one is invite your neighbors over to admire your grill and share the joy. Your brick grill shouldn’t be too far away from your house so that carrying utensils and food will be a chore. Keep the grill away from anything flammable such as overhanging trees, and the space should be relatively level. Determine the wind direction before building the grill so that smoke won’t blow into your face, your house, or your neighbors’ houses. 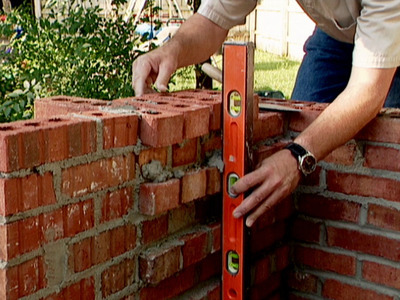 A solid foundation will prevent the brick grill from tipping over. A really good foundation begins about 4 inches below the frost line. Excavate an area that is 4-feet squared before lining it with 6-inch wooden forms. Mix some cement and pour it in to a depth of 3 inches. Reinforce the cement with 3 pieces of 0.5-foot long rebar spaced 12 inches apart. The rebar are covered with 3 more inches of cement before the top is smoothed down to slope forward about 0.5 inches to allow water runoff. The cement must set for up to 48 hours before you proceed further. Design your grill while waiting for the cement to set. The grills are usually 30 inches high while the fire pan that holds the charcoal is 4-5 inches under the grill. The frame of the grill should fit around the grill and fire pan, and not vice versa. You can also design 2 shelves about 16 inches wide to keep cooking paraphernalia close at hand. Two courses of bricks, without mortar, should be laid out on the cement base to determine the final layout. 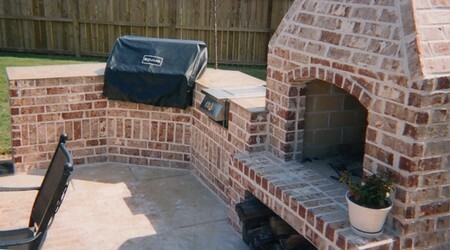 It is suggested that the bricks used in the course of how to build a brick grill should be sprayed with water the day before they are to be used. This prevents the dry bricks from drawing moisture from the unset mortar and weakening its hold. The mortar is made by mixing 1 part cement, 0.25 parts hydrated lime and 3 parts masonry sand with water to the consistency of soft mud. The first course, or row, of bricks is laid on a row of mortar, with 0.5 inches of mortar between each brick and course throughout. Ensure that the first course is level before building up the walls. The walls should be built up at the corners for 3-4 courses before the corners themselves are filled out. Always check if the courses are level and the walls straight after every 3-4 rows. If needed, bricks can be cut with a wide blade chisel and hammer. Three or four pieces of rebar are inserted at the appropriate height to hold up the grill and fire pan.